Voters line up prior to casting their vote in Senegal's legislative election, July 30, 2017, in Dakar. Voters in Senegal are casting ballots in a legislative election that has brought the country's former longtime leader back to the political scene. Wade was president from 2000 to 2012, when he was defeated by current President Macky Sall. 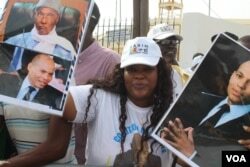 He returned from France this month to campaign in the parliamentary contest, though critics accuse him of re-entering Senegalese politics to try and pave the way for his son to return as well. Karim Wade has been in Qatar since his release from prison in 2016 after serving three years on corruption charges. Unlike many of its West African neighbors plagued by dictators and coups, Senegal is known for its political stability.